Pray for many to arise in Aglow International in Réunion. Background: This wildly beautiful and rugged volcanic island (with a very active volcano), was uninhabited when discovered by the Portuguese in the early 16th century. In 1643 it was claimed by the French. They named it Bourbon and established their first colony here in 1662. In the years that followed, slaves from Africa were imported to work the sugar plantations. 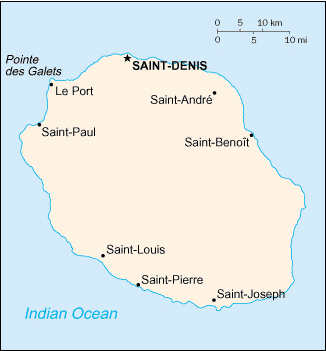 The island was renamed Reunion in 1793, and it remained a French colony, except for a brief British occupation from 1810 to 1815. Over time, French immigration, supplemented by influxes of Africans, Chinese, Malays, and Malabar Indians, gave the island its ethnic mix. The island’s economy is dominated by the sugarcane industry, and its main exports include sugar, seafood, rum, and vanilla. Tourism, especially from Europe, is a significant economic factor. The island is a French possession, and therefore uses the flag of France. Government Type: Réunion is an oversees department of France. The nation sends seven deputies to the French National Assembly and three senators to the Senate.